Habitat and nesting locations are in sharp decline throughout regional NSW, particularly for wetland dependant water birds. The draining of wetlands for urban expansion, along with the encroachment of weeds, has meant that wetland birds are declining in numbers. Gosling Creek Reserve, in Orange NSW, is a known stop-over point for wetland birds during their migratory flights. 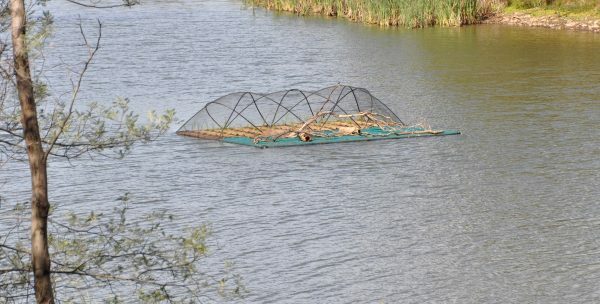 In March 2016, a 30 square metre floating island (or ‘habitat pontoon’) was installed at the Reserve to increase the availability of migratory bird habitat. The Island provides a predator-safe nesting site, while tree and shrub planting around the banks of Gosling Creek will add to the project, and will provide habitat opportunities. The floating island being launched on the banks of Gosling Creek. Photo: Nigel Hobden, Orange City Council. The majority of the floating island is planted with sedges, rushes and reeds. Placement of hollow logs and branches on the remaining area is used for roosting and nesting. The island is anchored in place and the roots of the plants will eventually make their way through the island’s netting base and absorb nutrients from the water. 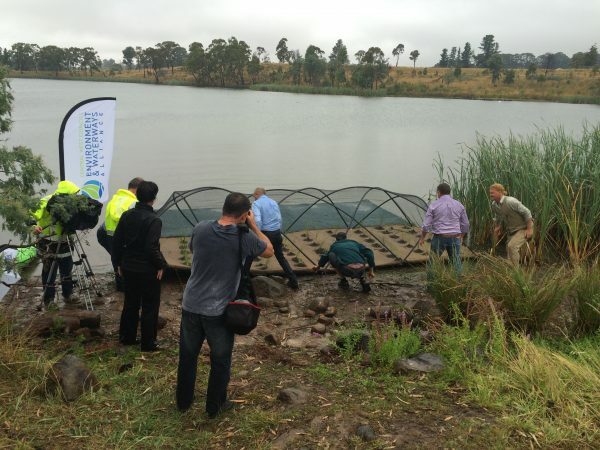 The project is a collboration between Central Tablelands Local Land Services, Orange City Council, and Environment and Waterways Alliance to improve habitat locations for migratory and other birds. As a partner, Orange City Council has a strong community awareness program. The floating island adds to this commitment. The project also enables private and public land managers to observe the benefits over time. The location of the island on public land and close to a bird hide enables visitors to the Reserve to observe birdlife activity. Regular monitoring may be carried out by local bird watchers and school groups can utilise the site for educational purposes. The island habitat awaiting its first visitors. Photo: Nigel Hobden, Orange City Council. The floating island can be added to as funding becomes available. This increases the surface area of the island and adds to the long term benefits. Visit the demonstration site – Gosling Creek Reserve, Bloomfield Road, Orange NSW.